200 New Foes for the 13th Age! "Don't worry, guys. It's just a bunch of orcs." 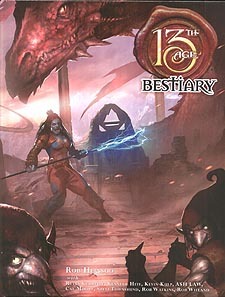 The 13th Age Bestiary introduces all-new creatures for the 13th Age roleplaying game, plus surprising takes on some of your favourite monsters. It includes the fun and flexible mechanics you expect from 13th Age - and it makes every monster an adventure in its own right, with story hooks, icon relationships customisable campaign elements and more advice on building exciting battles. And because only you know for sure how to mold our monsters to fit into your 13th Age game, you'll find a variety of approaches to choose from.